tl;dr: Starting a startup is more expensive today, too much money used to spoil startups (but doesn’t anymore), and, by the way, the Series A Crunch is a real thing. There’s this notion that it’s cheaper to start a tech startup today than, say, ten or twenty years ago. In one sense, the meme is right: open source code frameworks, on-demand cloud compute infrastructure, and other factors have drastically lowered the costs of building software startups. And rapid prototyping techniques, 3D printing, and advances in manufacturing and materials sciences have democratized access to the hardware sector. Sure, building the underlying technology behind a startup may be cheaper and easier today. But what about building the business as a whole? There are likely many ways to answer this question, but we’ll focus on the rate at which startups that received Seed or Angel funding are able to raise a Series A round. Why this approach? For the past dozen or so years, startups have used Seed and Angel investment to build the first iterations of their technology, hire the first key members of the technical and business teams, run some marketing experiments, and, ultimately, gain sufficient traction to justify raising a Series A round to fuel continued growth. If it is cheaper to start a startup now than ever before, we’d expect to find that startups that have raised smaller seed rounds in the past few years are more likely to raise a Series A, when compared to startups that raised similar amounts of money in the past. Startups that raised pre-Series A funding between 2004 and 2011. Startups that raised pre-Series A funding between 2012 and 2014. We excluded 2015 and 2016 because it’s too close to the present day. Startups that raised Seed or Angel funding in ‘15 and ‘16 simply haven’t had enough time to mature to make any meaningful observations. What does our analysis show? It’s more expensive to start a startup today than it was in the past. Note the steadily increasing rate at which startups successfully raise Series A rounds as they raise more from Seed and Angel investors. There is no appreciable decline in rates of future fundraising success. In other words, each dollar these relatively new companies raise prior to Series A is positively correlated with future fundraising success, at least up until the $4 million mark. After that point, the data are thin, so it’s hard to say whether the positive trend continues beyond that point. We think that a bit of a correction is in order. 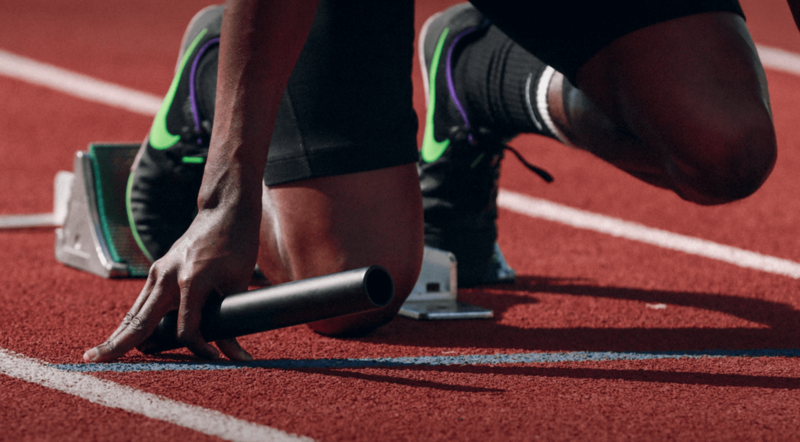 A couple of months ago, we performed a similar analysis to determine whether too much Seed and Angel funding has the potential to harm a startup. Our conclusion then: nope, raise away! But now that we have disaggregated the data we used in that piece and dug a little further back in history, that advice wouldn’t hold up between 2004 and 2011. There is a very clear tipping point—somewhere between the $2-2.5 million mark—at which pre-Series A stage startups of a certain vintage were spoiled by too much money. 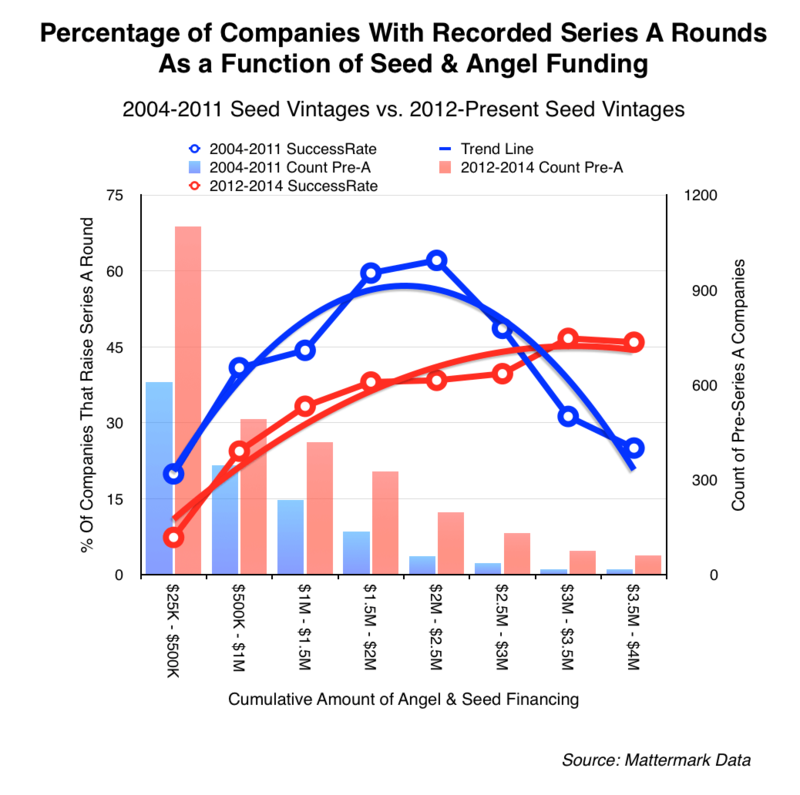 Notice how the overwhelming majority of startups that raised Seed or Angel funding before 2012 successfully raised Series A rounds at a much higher rate than those funded between 2012 and 2014. That even takes into account those companies that raised pre-Series A money during the Great Financial Conflagration of 2008-2010. As we’ve previously shown, about two-thirds of startups fail to make it to Series A. In startup and VC lore, there seem to be only two great epochs: Pre-Dot-Com and Post-Dot-Com. But it seems like we need to split the Post-Dot-Com epoch into two. Pre-crunch era. Startups experienced a quiet recovery and were lower-case “l” lean times with only a modest amount of pre-Series A dollars to go around. This was just fine. A company didn’t need to lay out $5 million for servers just to get a website online. Post-crunch era. After the ‘08 financial crisis, pre-Series A investors may have ended up being a victim of their own success. Lots of capital allowed for burn rates to creep up, and the Seed round became the new Series A. So it seems to make sense that we now have the Dot-Com Bubble era, the Pre-Crunch era, and the Post-Crunch era. For Seed and Angel-funded companies in the Post-Crunch era, burn rates are high, startups are raising more than they likely need, and the rate at which they can make it to Series A is lower now than a decade ago. These sorts of companies play by an entirely different set of fundraising rules.